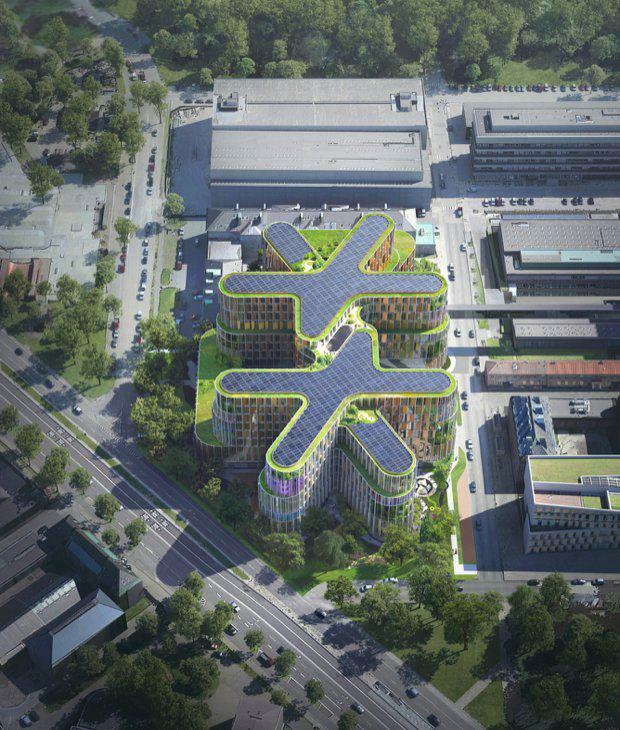 Danish architecture firm 3XN has won a design contest for a new USD$350 million children's hospital in Copenhagen. 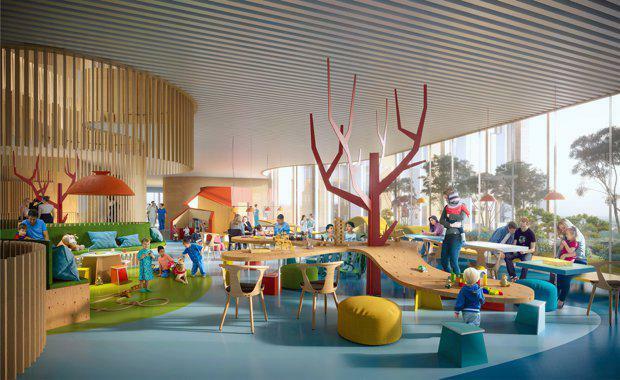 The proposed children's hospital, BørneRiget, aims to set new standards for the treatment of children, adolescents, pregnant women and single families. The danish practice's 'playfully logical' proposal emphasises the power of play – an attempt to revolutionise the experience before, during and after treatment. The general principle at BørneRiget is that the specialists come to the child, the adolescents, the women in labour and the family – not the other way around. The 58,660 square metre building is distinctive: shaped as two hands gathering all children, adolescents and women in labour under one roof taking care of the whole family. Gone is the feeling of life coming to a standstill while being hospitalised and gone are the incoherent courses of treatment. The new building creates a framework that provides families the opportunity of being together as a family while having the most regular and safe everyday life as possible. 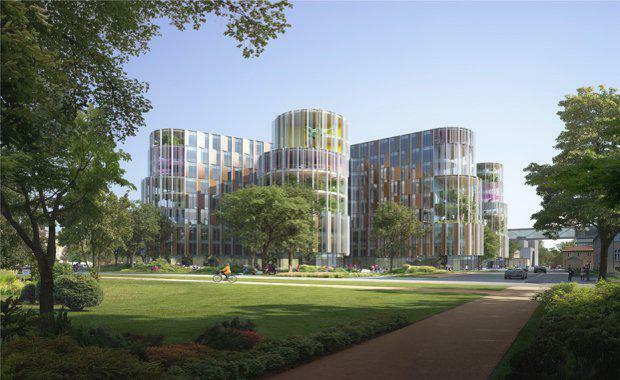 The winning design by 3XN was pitched as "playfully logical", which symbolically takes its point of departure in two hands that stretch their "fingers" into the light, into the city and into the green. Before revealing their design on 23 August, 3XN had prepared the design proposal in collaboration with Arkitema Architects K/S, NIRAS, Arkitekt Kristine Jensens Tegnestue and Rosan Bosch. 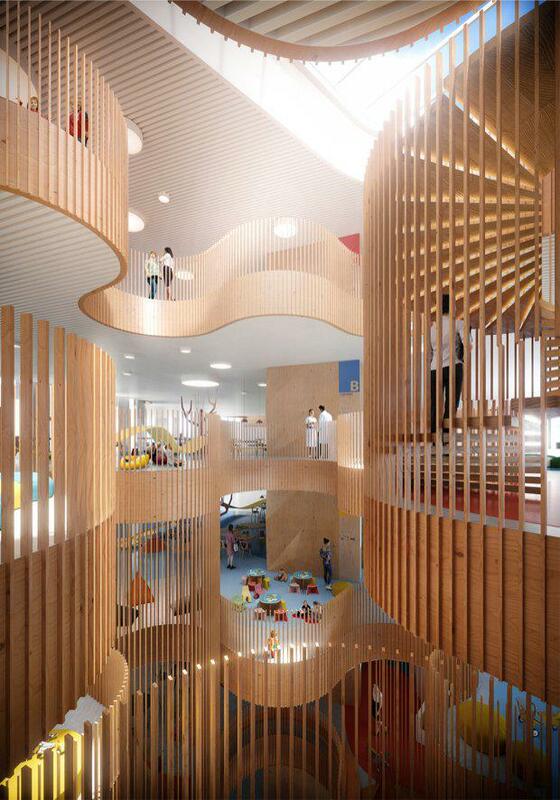 The hands form the organisational structure of the building, each "finger" leads to patient rooms and, at the end of each finger, a winter garden unfolds. The public centre "wrist" provides lounge areas for family members. The finger design ensures short distances to the individual bays in all fingers and simultaneously ensures a distance of maximum 20 metres from each bay to the nearest garden – as in an ordinary house. BørneRiget will make up 58,000 square metres distributed throughout nine floors. "BørneRiget gives children, adolescents and pregnant women a safe and modern experience at the hospital," Copenhagen regional council chairperson Sophie Hæstorp Andersen said. "Children will not stop playing because they become ill and BørneRiget can and will support this fact. At BørneRiget it is possible to maintain an everyday life as normal as possible while being treated and that is of great importance. The Capital Region of Denmark donated DKK1.4 billion for the project. 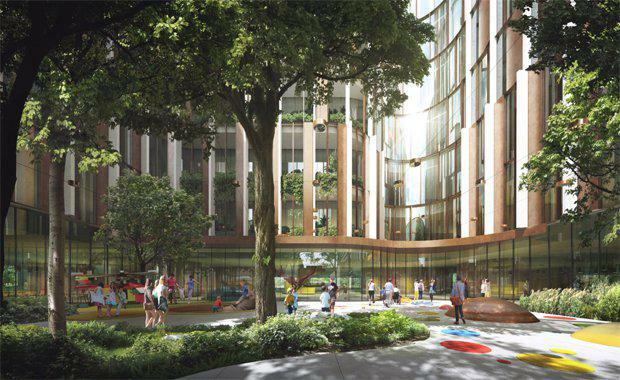 "It is an important milestone that we now have a winner of the design contest who will create the framework of the new hospital," Ole Kirk’s foundation chairman Kjeld Kirk Kristiansen said. "It is crucial that children and their families feel safe in a course of treatment and that they can maintain the best possible quality of life. There has to be room for the family to have a nice time together; there has to be room for play, care and diversion in order for the child and the family to have a breathing space from all the concerns." The building has a sculpturally strong appearance and will become an icon for BørneRiget with its playful and inviting mode of expression. 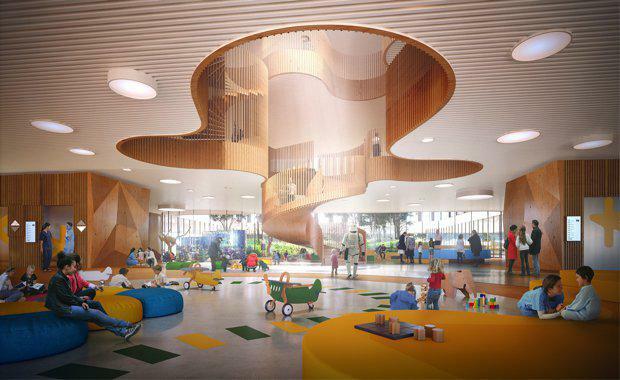 It is a building that meets a lot of the users’ many demands and wishes for a building that needs to be clinically efficient and at the same time provide safety for children, adolescents and families." The new children’s hospital will accommodate up to 1,200 doctors, nurses and other staff members. The project is estimated to be completed in 2024.